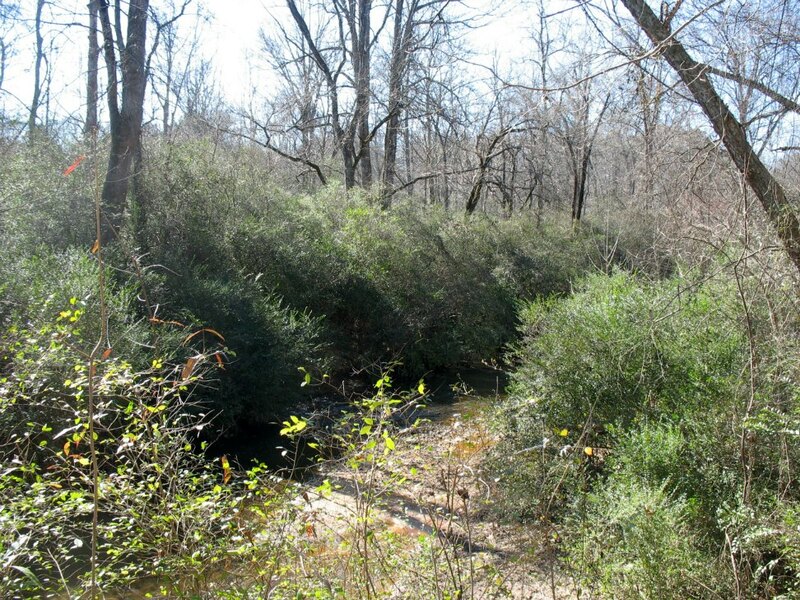 Unlike a rambunctious vine such as kudzu, plant invasiveness is not always immediately apparent. 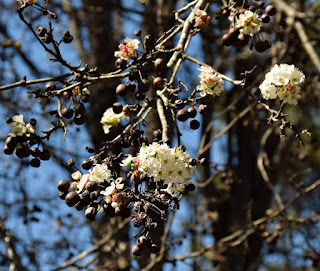 This is the time of year that the wild spread of ornamental pears (Pyrus calleryana) in Georgia, however, is especially apparent. White-blooming trees on the side of the road this time of year are not native; we don’t have trees (in North Georgia anyway) that bloom this early. People might think this is a bonus. 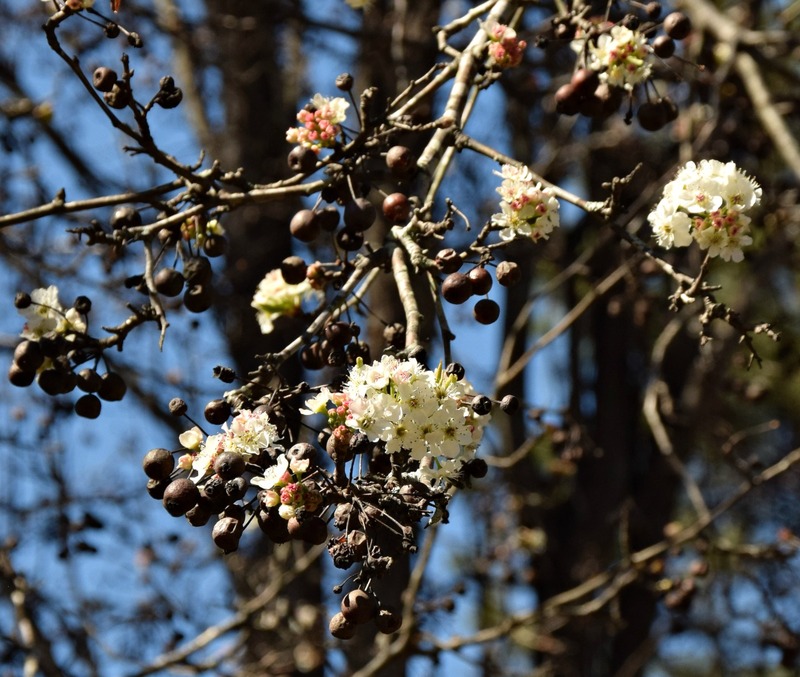 “It’s nice to have these blooming trees so early!” And it would be if the plants weren't invasive, spreading into areas and crowding out what native plants might have been there. 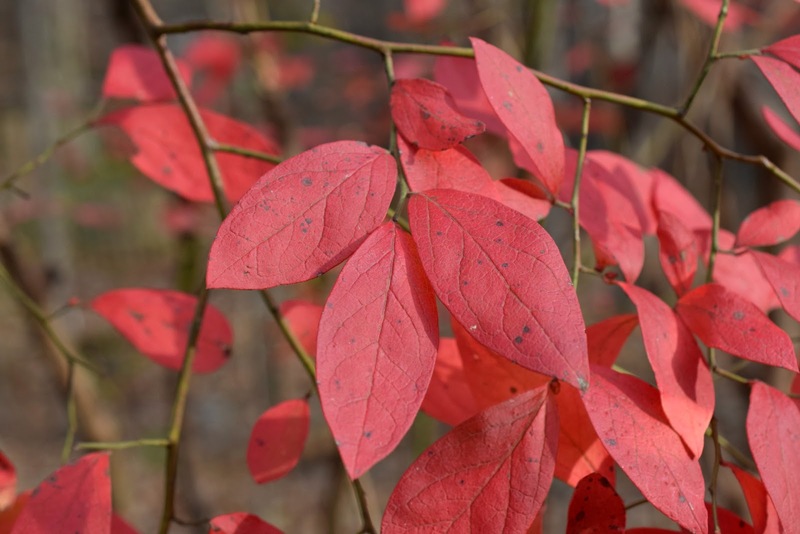 These trees create dense foliage and replace native trees like maples, redbuds, sassafras, and serviceberries that would naturally grow in the part-shade woodland edges. These pears only provide one kind of support to insects: pollen for bees which are often non-native honey bees. Unlike native trees, they provide no services to insects the rest of the year, such as for butterfly and moth larvae. Insect diversity suffers when one plant takes over. When do we know that something has become invasive? How does it start? It usually starts with cultivation which introduces the plant into ornamental landscapes (yards, parks, etc.). Sometimes the cultivated plant (developed by nurseries for traits like better flowers or fruits) is actually promoted as ‘sterile,’ meaning that it won’t set fruit (really they are just self-incompatible, not actually sterile as has been proven since then). This was true when ‘Bradford’ pears were sold beginning in the mid-1960’s (the nurserymen must have realized that the tiny fruits were a problem if they felt that declaring it ‘sterile’ was a plus?!). Once enough of them are in the broader landscape (enough of them for pollinators to fly between), plants exchange generic material (pollen) which makes many of them have a better fruit set. Japanese honeysuckle (Lonicera japonica) is an example with many years of history. Collected from Asia in 1804, cultivated in the US by 1842, 'improved' in 1862 ... the first documentation of its escape to the wild was in 1882. By then, it had been planted in thousands of gardens. It is now considered to have invaded more acres in the southeastern US than any other non-native plant (including kudzu which is more noticeable but on far fewer acres). It doesn’t take a math major to figure out how things multiply into increasingly large numbers. My neighborhood has a large amount of non-native mahonia (Mahonia bealei). In the 15 years that I’ve lived here, I have removed on average about 3 seedlings a year. That’s not much, right? If I hadn’t, however, I’d now have 45 plants in my two-acre yard. Each one would be flowering and creating more. I have neighbors with large amounts of this plant (one is even proud of how many he has). Each year, they spread further down the road, as birds eat the fruits and fly just a little bit further. Instead of having mahonia, my woods have more blueberries, more native azaleas, more viburnums and other native shrubs. I have more diversity than if I’d let this plant grow as often as it showed up. Same with the callery pear: every year, fruit gets carried just a little bit further by a bird, a squirrel or even a human. We should absolutely stop planting it and stop selling it. Just as important: we should be removing these escaped plants, because every one of them adds to the multiplier effect. These wild pear plants are especially fruitful. Please remove any that you find. 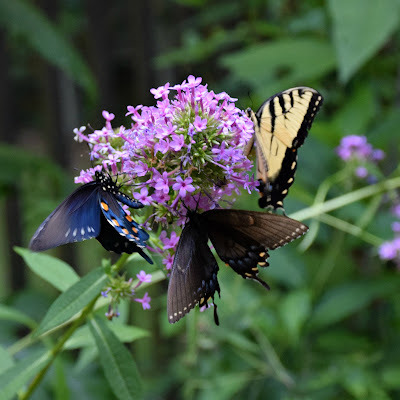 Support our native insects by making room for native plants. 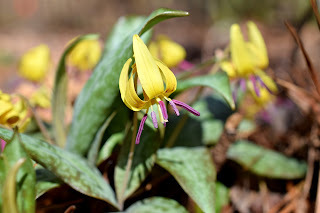 The dimpled trout lilies (Erythronium umbilicatum) started blooming last week; I came home from a business trip on Thursday, Feb 7 and one clump already had flowers. It was wonderful to see them, as always, and perhaps just a smidge earlier than last year where my first picture has a date of Feb 11. 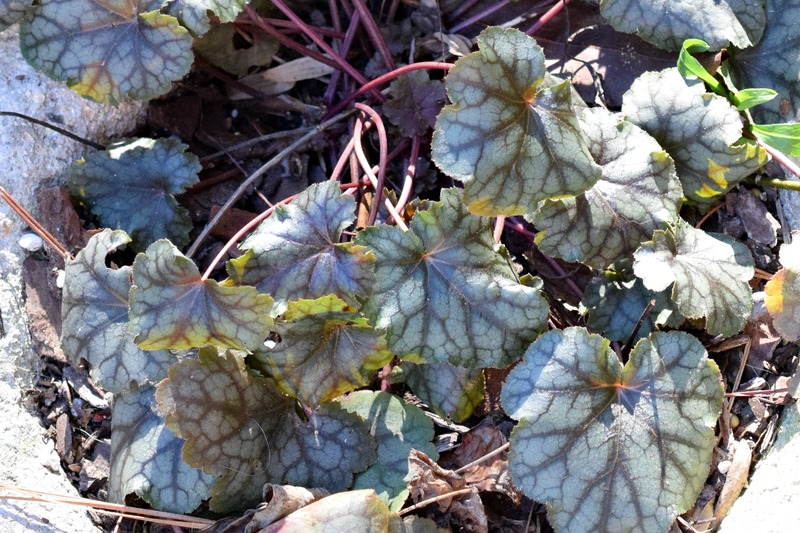 It’s always a race between them and hepatica (Anemone americana, formerly Hepatica nobilis var. obtusa) to see which shows up first. This early sign of spring is much loved by me and many others. One of my friends died this week after being suddenly diagnosed with late stage cancer. The dimpled trout lily was one of her favorites. 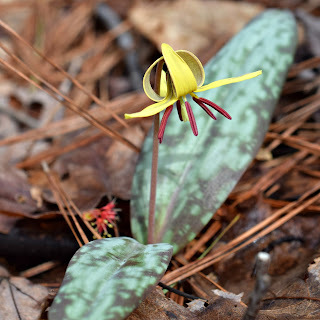 As a volunteer for the National Park Service and the Georgia Botanical Society, she spent many hours leading field trips in February and March to places where the trout lilies bloomed. Chattahoochee River National Recreation Area was a favorite area and she would showcase the trout lilies there at Cochran Shoals/Powers Island and at West Palisades/Paces Mill. She also liked to help people get native plants into their gardens, and she used her role as a rescue facilitator with the Georgia Native Plant Society to help people rescue trout lilies that were in the path of construction. Land conservation was also important to her and so she was very happy when Wolf Creek Trout Lily Preserve in South Georgia was saved in 2009. She leaves behind a lot of friends inspired by her joyous love of nature and tireless zeal to encourage others to know, love, and conserve it. For me, the dimpled trout lily will always remind me of her. This one’s for you, Maureen. Georgia experienced some cold overnight temperatures this week; while not our lowest (I have seen 5 degrees here before), temperatures did go down to 21 degrees two nights in a row. As I went outside to refill the bird feeder, I noticed that some of the evergreen plants that I bragged about in last week’s blog were looking quite bad. Surely they were goners? 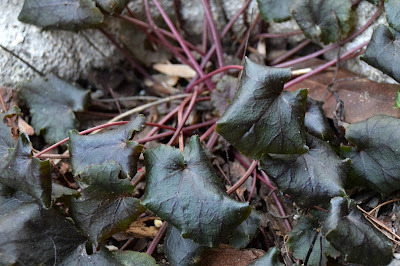 In the case of the alumroot (Heuchera americana) in a pot by the door, the wide leaves looked almost black and shriveled. 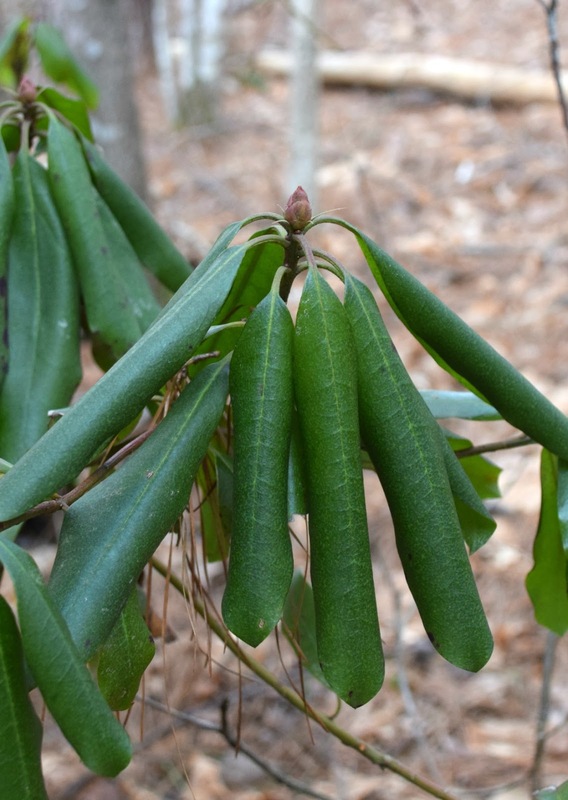 I walked around a bit to look at some of my other broad-leaved evergreens like the ginger (Hexastylis shuttleworthii), and shrubs like Florida anise (Illicium floridanum) and rhododendron (Rhododendron sp). They were definitely affected by the cold. How did the needle-leaved evergreens look? I checked out the hemlock tree (Tsuga canadensis) to see how its needles were faring. Skinny and covered with a light waxy coating, they showed no difference from how they look in above freezing temperatures. Heuchera americana as the temperature exceeds 32 degrees - magic!